Polycom announces a RealPresence CloudAXIS suite that allows users to video conference across multiple consumer platforms and devices at a price accessible to SMBs. Polycom Inc. says it will make the dream of simple and affordable video conferencing across multiple platforms and devices a reality. Historically, high costs, poor video quality, tough usability and a lack of scale to mobile devices have dogged video conferencing adoption. Polycom says it has solved all of these issues with new backwards-compatible solutions aimed at enterprises, SMBs and service providers. 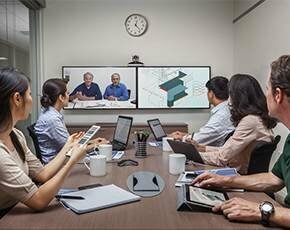 The most significant of the 20 new releases is a software download that triples video call capacity for a fraction of the cost of a video bridge, and the Polycom RealPresence CloudAXIS suite, which allows customers to make a high-quality video call with someone on Skype, Facebook or FaceTime with a click of a button on their iPad tablet or Android phone, the San Jose, Calif.-based company said. The video conferencing industry has been struggling with interoperability, collaboration and cloud adoption, according to Ira Weinstein, Wainhouse Research senior analyst. Polycom's new RealPresence CloudAXIS and the incorporation of video compression standard H.264 SVC are aimed at solving these issues, he said. What can Polycom RealPresence CloudAXIS do? CloudAXIS is a Web client with an HTML5 plug-in that allows organizations to video conference with any video application. CloudAXIS includes an intuitive self-service interface that allows users to select video collaboration programs from a list and incorporate them into a corporate directory. A Polycom user can start a video call, Web conference or instant message chat with up to 40 people by clicking and dragging their names from that directory into a session. Users can also invite people from outside the corporate network. CloudAXIS will send them an IM with a link to the Polycom video conference. This aspect of the product requires no software download. People outside the corporate firewall can join these sessions through their preferred Web browser. "When you click on that link, you're going to activate Polycom's video collaboration technology, which will give you a secure IT-certified link into the conference at a much higher HD enterprise quality, such that you're going to have a much better experience than any of the other consumer-type product," said Jim Kruger, Polycom's senior vice president of marketing. CloudAXIS will be available to enterprises in November 2012 and to service providers early 2013. How does Polycom's solution compare with other vendors? Other companies have also been bridging enterprise consumer video conferencing. Microsoft purchased Skype, and video conferencing cloud provider Blue Jeans Network offers browser-based interoperable video conferencing as a service and is rapidly gaining market share. "From the end user perspective, [Blue Jeans and Polycom's CloudAXIS] probably would look quite the same because [they both] accomplish the interoperability between Skype, Google Voice, and FaceTime," noted Henry Dewing, principal analyst at Forrester. The difference, Weinstein explains, is that Polycom can deliver this interoperability as an on-premises technology. Polycom is fundamentally changing the way it delivers video conferencing. It has adopted a layering approach with the H.264 scalable video coding (SVC) codec used in the RealPresence Platform to encode video signals into layers -- a base layer and an enhancement layer. These layers are sent to a media router that forwards the appropriate layers to a user's device. For example, a mobile phone would receive only the base layer while a high definition video conferencing console would receive both the base layer and enhancement layer for 1080 screen resolution at 60 frames per second. "This method is very different from the traditional method of sending the video signals as a single encoded signal to a video bridge or MCU [multiparty control unit]," Weinstein said. "In this method, the MCU decodes the signal, mixes it with other signals, and then re-encodes a version of the signal to send to each participant. This 'traditional' method is processor intensive and thus expensive." This layering model eliminates the need for a video bridge or MCU, he explained. However, SVC use has not been exclusive to Polycom. The SVC codec has been in use by Avaya Radvision and personal telepresence vendor Vidyo. While Vidyo does not possess the market share of Polycom, Avaya is a closer contender in the market. Polycom will add SVC routing to its RMX video bridges via a $5,000 software download for two times more the capacity of a former bridge, which ranges anywhere from $35,000 to $400,000 -- i.e., a video bridge with a 10-caller capacity would be able to call up to 30 people using the software. "You can deploy three times as many endpoints across your organization, whether it be in a conference room, mobility applications or the desktop -- all for the same price that you pay today. That's a huge savings for our existing customers and opening up the doors for new customers coming in as well," Kruger said. This interoperability will also appeal to companies with heterogeneous video conferencing and UC environments. While 60% of customers prefer a single vendor, mergers or acquisitions make it difficult for them to maintain homogeneity, said Forrester's Dewing. "Interoperability has been nothing short of a nightmare," he said. Dewing said Polycom's new technology will foster interoperability as an add-on technology, and be compatible with multiple solutions like Microsoft Lync. RealPresence Collaboration Server 800s, Virtual Edition, is a multi-protocol software MCU that runs on industry-standard servers. It is expected to be available November 2012. SmartPairing uses sonic pairing technology to share information among devices and gives users the ability to swipe a call from an iPad to a big screen in a video conferencing room. RealPresence Group Series 300, 500 and 700 is the next-generation of video collaboration endpoints enabled for high definition and updated for improved user experience. Coming November 2012. An updated user interface (UI) makes video calling simple and intuitive and will enhance an overall user experience.